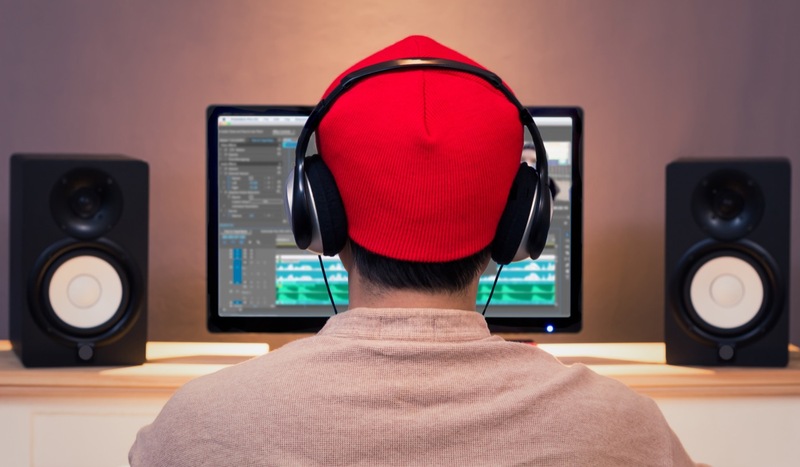 Adobe Premiere Pro provides users with a plethora of great tools for editing audio, including a number of mixers, meters, effects, and panels. But remember, it’s not so much the tool that matters, but how you use it. Below I’m going to show you five different ways to edit audio with five particular tools inside of Premiere Pro. And before you ask, no, none of these tools is Adobe Audition. When working with audio in Adobe Premiere Pro, don’t get your terminology mixed up—gain is separate from volume. Gain generally refers to the input level of an audio clip, while volume refers to the output. You can visualize the gain of an audio clip via audio waveforms in the source and/or timeline panels, while you can view volume via audio meters. Think of gain as the loudness of the audio source. Remember, when you record audio you must adjust the gain to get sufficient levels. Speaking of sufficient levels, if you’re working with audio that was recorded properly, then in post you shouldn’t have to make many adjustments to the gain. As we all know, however, audio is rarely recorded properly. Therefore I introduce to you the Audio Gain dialogue box. This little tool offers a number of different features. You can access it by grabbing a clip and selecting Clip > Audio Options > Audio Gain, or just by pressing the shortcut key G. Selecting a clip in your timeline will only adjust the gain of that particular clip. Selecting a clip in the project panel will naturally adjust the master clip, affecting all corresponding clips in timelines. You can make gain adjustments to one or multiple clips at the same time. One of the most useful aspects of this dialogue box is the Peak Amplitude readout. This allows you to quickly reference the loudest part of your clip to see if it needs to be adjusted. You can use this reading as a baseline from which to match all of your other audio clips. There are four ways you can adjust the audio gain in Premiere Pro. The first two options are quite simple—you can set the gain to an entirely new amount; or adjust it incrementally. When you change the Adjust Gain amount, that amount will be added incrementally to the Set Gain property. If you don’t want to manually type in a new gain amount, you can automatically set new levels by using the normalization options. Normalize Max Peaks will automatically bring your peak amplitude to the level you specify. This can be very useful when adjusting levels for broadcast standards. If you’re working with multiple clips, you can use the Normalize All Peaks feature. The Normalize All Peaks feature will independently change each clip’s gain so that the loudest sounds hit the levels that you specify. That can work very well when selecting many dialogue clips, for instance, but be careful that you don’t select a clip that is supposed to be quiet. If you also selected a clip that was supposed to provide gentle background noise, for instance, it would amplify the background noise until it matches the levels of your dialogue. Not a good thing. As I said before, the audio waveform shows you the gain of a clip. When you make gain adjustments in the Audio Gain dialogue box, you’ll notice the changes being reflected in the size of the audio waveform of the audio clip in the timeline panel. Expand your audio track and enable audio waveform displays to keep an eye on your audio as you make gain adjustments. One additional thing to be aware of—when bringing up the gain of an audio clip, you are also bringing up the background ambience, often times amplifying unwanted sounds. Again, recording good audio in the first place is always good practice. Bringing the gain down is almost always better than bringing the gain up. Audio mixing can be a headache-inducing task. It can also be a wristache-inducing task, depending on how much keyframing needs to be done. Keyframing with the pen tool in the timeline panel can quickly become tedious and time-consuming. But it doesn’t have to be. The Audio Track Mixer panel contains a number of different automation modes that allow for quick and easy audio mixing, including Off, Read, Latch, Touch, and Write modes. You can find the automation modes drop-down menu located just above the fader bar of each track in the Audio Track Mixer panel. When you have an audio track set in one of the three write modes (Write, Latch, or Touch), Premiere will automatically add track keyframes when you make changes to an attribute, whether it’s the volume or the balance. The track keyframes can be found on the corresponding track in the Timeline panel. To view track keyframes in the timeline, you must go to the Show Keyframes option in the track header and select Track Keyframes. You can keyframe values for an individual clip and for a track independently. The default view is set to display Clip keyframes, so be sure to change it back when you’re done editing the track, otherwise, things might get confusing for you later when you’re trying to keyframe an individual audio clip. Regarding the specific automation modes, each one performs slightly different to the other. For Latch mode, automation doesn’t begin until you start adjusting an attribute, such as dragging down the volume fader bar. When you release the fader bar, it will latch and stay in that position until you stop playback. For Touch mode, automation begins when you adjust an attribute. However, it will slowly return to its last position when you release the controls. While in Write automation mode, Premiere will automatically add keyframes to an attribute as you begin playback. Once playback is stopped, the automation mode will switch to Touch unless you specify otherwise. None of these automation modes is the end-all-be-all solution. Simply pick your flavor and mix away. Once you’re done with your track edits, be sure to set the automation mode back to Read. Turn the automation mode to Off if you want Premiere to ignore all of the track keyframes for that particular track. As with audio tracks, adding keyframes to audio clips via the Timeline and Effect Controls panels can be very tedious. If you aren’t super excited at the idea of using the Pen tool to add and adjust individual keyframes by hand, then the Audio Clip Mixer can be a godsend for you. Similar to the Audio Track Mixer, the Clip Mixer allows you to mix audio on a clip level. While the Audio Track Mixer panel has a substantial number of tools and options when it comes to editing audio, the Clip Mixer is a bit more streamlined. While it doesn’t have the same number of automation modes, it does have a write keyframes automation feature. To activate this, simply press the Write Keyframes button just above the fader bar, to the right of the Mute and Solo buttons. Once turned on, this feature will allow you to add keyframes on the fly during playback. Add keyframes for Volume using the fader bar and Balance using the nob at the top. You can even animate stereo audio channels separately via individual fader bars. Be aware that the default automation mode for the Write Keyframes feature is Touch; however, you can switch it to Latch at any time via the panel drop-down menu. In the Effects panel, you’ll find a number of audio effects available. You can apply these effects to an audio clip with a simple drag and drop, either to a clip in the timeline or straight onto the Effect Controls panel when a clip is selected. Once applied you can further edit and adjust the properties of the effect in the Effect Controls panel. While there is a large number of audio effects available (50+), many of them require advanced knowledge to use. As an example, take a look at the Adaptive Noise Reduction effect. I’m sure a good majority of video editors out there are unfamiliar with the terms Spectral Decay Rate or Broadband Preservation. Plenty of other effects have advanced attributes that are quite difficult to understand, especially for the large number of us that are not seasoned audio engineers. In response to this problem, Adobe recently introduced the Essential Sound Panel. The Essential Sound Panel is a new way to work with audio in Adobe Premiere Pro. The panel simplifies and demystifies many common audio editing tasks, showing you only what is essential. It allows you to assign an audio type to a clip (Dialogue, Music, SFX, or Ambience) and then apply changes to the clip with easy to use Presets and slider bars. For instance, many editors don’t know how to properly clean up dialogue. You could apply that Adaptive Noise Reduction effect and try out your luck; or you can simply open up the Essential Sound Panel and select the Clean Up Noisy Dialogue preset. And voilà. Now that background hum in the documentary interview you just shot won’t be such a problem. So how exactly is it doing this? Well, if I open up the Effect Controls panel I’ll notice that Essential Sound applied not one but three audio effects to my clip, including Adaptive Noise Reduction. To really see what’s going on, I’ll open up the custom setup section of the Adaptive Noise Reduction effect. As I slide the Reduce Noise slider bar in the Essential Sound Panel, you’ll notice that all six slider bars are adjusting in the effect. Pretty cool stuff! In addition to cleaning up noisy dialogue, the Essential Sound Panel can achieve many other results. Quickly add reverb, remix music to a specific length, or change the pitch of a voice. You can modify and save your own presets once you’ve customized the audio to your liking. However, there’s far more to audio meters than meets the eye, or ear. And seriously, what’s the point of spending all of this time editing audio if you can’t properly understand how to view and read the output? One common issue you may encounter as an editor is the task of adhering to audio requirements. This is especially important when working in the broadcast realm. Often times you’ll be asked to keep your peak amplitude at a target level while not letting the valleys dip below some other specified volume. Therefore it’s important to see these peaks and valleys when monitoring the audio. Again, for those of you that may not be familiar with the audio terminology, peaks show you the loudest points of an audio clip, while valleys display the quietest areas. Peaks and valleys allow you to view the dynamic range of your audio, and it’s important to keep an eye on both of them while editing. Thankfully, Premiere Pro allows you to customize the audio meters display to view these options and help keep your audio levels precisely where you want them. Let’s take a look at how to accomplish this. To open up the audio meters panel go to Window > Audio Meters. Be aware that valleys aren’t visible in the default setting of the audio meters panel. To view the valley indicators, right-click within the panel and select Show Valleys. Now you will be able to see both peaks and valleys together. Even with the indicators active, viewing the peaks and valleys of your audio can prove to be quite difficult as the levels in the meters are bouncing up and down quickly, constantly changing. To combat the constantly fluctuating peaks, you can switch the display from dynamic peaks to static. While dynamic peaks update every second, static peaks will keep the indicator display at the loudest peak for the duration of playback. Valleys will also stay static when you select Static Peaks. Also, dynamic peaks will vanish after you stop playback, static peaks will stay visible. You can reset static peak indicators by right-clicking in the panel and selecting Reset Indicators. In addition to customizing the peaks and valleys, you can also modify the decibel range readout of the meters, change the color display, and switch between monitoring mono channels or a stereo pair. Both the Audio Track and Clip Mixers have all of the same modifications available for their respective audio meters. As I stated earlier, the audio meters in the Clip Mixer Panel even allow you to adjust the left and right channels of a stereo pair separately via individual channel volume fader bars. So what do you think? Do you like the tools mentioned above? Have you used them before? Which audio tools do you use in Premiere Pro? More importantly, HOW do you use them? Let us know in the comments section! Thank you to Jason Boone for contributing this article. Boone's short-form documentary work has been featured on National Geographic, Yahoo!, Bing, Fuel, and Current TV. While he's not busy creating tutorials on Adobe Premiere Pro and After Effects, he vlogs about living as an American expat in Paris.